Dr Carl Diver is the academic lead on Industry 4.0 and a reader in industrial digitalisation at Manchester Metropolitan University. Prior to academia, Carl worked in the manufacturing sector for over 20 years firstly for a large multi-national and then establishing his own consultancy. At Delphi Automotive Systems, Carl’s focus was on fuel injection equipment from both an R&D and manufacturing angle. In his consultancy role, Carl worked for multi-nationals and SMEs on a range of products. He was also involved in a number of European-funded research projects and as an expert evaluator for the European Commission. More recently, Carl led Industry 4.0 activity, research and teaching for the manufacturing group in the School of Mechanical Aerospace and Civil Engineering at the University of Manchester. He helped establish the academic conference at the Industry 4.0 summit in Manchester and his PhD students won international competitions such as the Siemens Open Space challenge at Hannover Messe in 2018. Carl joined Manchester Metropolitan University in 2018 to lead on the University’s Industry 4.0 activities. Manchester Metropolitan University is ahead of the disruptive curve and leading the way in industry 4.0 education and innovation. 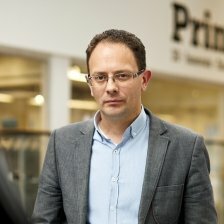 Its specialist digital manufacturing centre, Print City, brings together a range of technologies and materials and works closely with business on next-generation solutions. The University also has expertise in artificial intelligence, Internet of Things, big data analytics and cloud computing. Carl has been invited to speak on Industry 4.0 at conferences and events in the UK, Europe, the Middle East and Asia. He is an associate co-editor of the Virtual and Physical Prototyping Journal and continues to help businesses with more advanced, efficient and controlled processes.